Targa rallys are such a tough motorsports event. Start in one place, and drive hard over closed public roads for 5 days. This is the second year that Steve Millen has competed in the Targa with the STILLEN Nissan GT-R. The car is still relatively stock- engine, transmission, turbos, but is going up against some very modified, and very quick cars. Last year Steve finished 3rd, this year he finished in 4th. The competition really stepped up. Check out the video below, that shows just how hard Steve pushes the car though the stages, and head over to the Road and Track blog for more reports and pictures. STILLEN is making plans for next year, that will bring more car to the event. Steve and Jen pushed hard all week and were able to bring the car home with a fourth place finish. 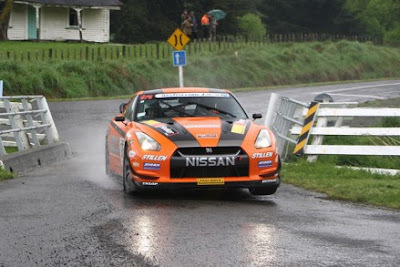 The event winner, Tony Quinn in his R35, won the Targa for the fourth time. Glenn Inkster, in his high horsepower Mitsubishi Evo VI, came in second just a few seconds behind Quinn despite having a couple of offs and having to take a tire penalty. Glenn Smith rounded out the top 3 in his 600+ horsepower Mitsubishi Evo X — which we all thought looked like it had just come out of a video game! Steve and Jen fought hard coming in fourth, securing their spot in the top five.